The Michigan State Spartans turned in an impressive bounce back season in 2017. Mark Dantonio's crew finished the season 10-3 after going 3-9 the previous season. With 19 starters returning from last year's team, the Spartans could have an outside chance of sneaking into the College Football Playoff. They take on Utah State, Arizona State and Central Michigan in non-conference play and will take on Big Ten rivals Michigan and Ohio State at Spartan Stadium. Sandwiched in between the non-conference schedule are match-ups against the Wolverines and Buckeyes and a road contest versus Penn State. A good barometer for the Spartans in their 10-plus win seasons has been their ability to stop the run and run the ball. Last season, Michigan State finished seventh in the nation in yards allowed per game and averaged 167 rushing yards per game (63rd overall). Running back L.J. Scott (6'1, 229) enters his senior season as the team's feature back and alongside quarterback Brian Lewerke (6'3, 212, Jr.), he will be tasked with carrying the offensive load. On defense, defensive tackle Raequan Williams (6'4, 300, Jr.) will be a run-stuffer. With a strong season, he could join other former Spartans defensive linemen William Gholston (Tampa Bay Buccaneers) and Shilique Calhoun (Oakland Raiders) in the NFL. The junior was a stabilizing force for the Spartans defense after they lost LB Riley Bullough to the NFL in 2017. Bachie finished last season with 3.5 sacks, two forced fumbles and three interceptions. Since Dantonio has come to Michigan State, he has been able to hang his hat on a middle linebacker to run the defense. If Bachie can turn in another productive season, he will join the ranks of Max Bullough, Riley Bullough and Darien Harris, all of whom have spent time in the NFL. As usual, the Buckeyes will field a team as competitive as anyone in the nation. 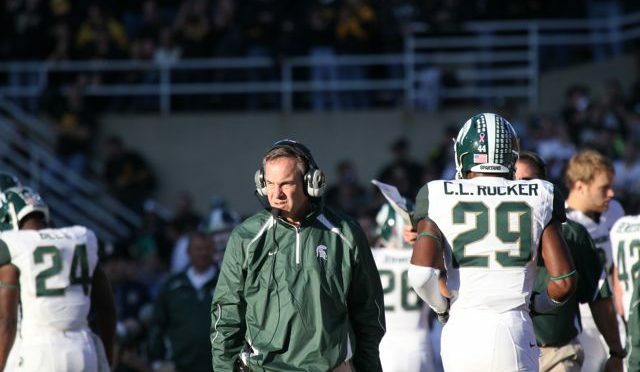 If anyone has been able to compete with Urban Meyer's Buckeyes it's been Mark Dantonio. The Spartans coach holds a 2-4 record vs. Ohio State and is the only coach to beat Meyer in the Big Ten multiple times. In last year's matchup, the Spartans lost to the Buckeyes, 48-3, in Columbus. The Spartans have several senior prospects worth keeping an eye on in 2017. Perhaps none can help their NFL hopes more than Willis. Despite 2017 being his first year as a full-time starter, the former high school running back has blossomed into one of the Big Ten's most active safeties. While he will occasionally overrun some tackles due to over-aggressiveness, he generally breaks hard on the ball in pursuit from the inside-out. On top of that, he demonstrated a sufficient ability to open-and-run with wide receivers when defending vertical concepts a season ago (see Western Michigan '17). He's had some slight durabilty hiccups, but the 2017 Honorable mention All-Big Ten safety is primed for an impact senior campaign. The Spartans will run through the early part of their schedule with flying colors but Draftnasty's Troy Jefferson is predicting a home loss to the Ohio State Buckeyes in November, reminiscent of their 2014 season.